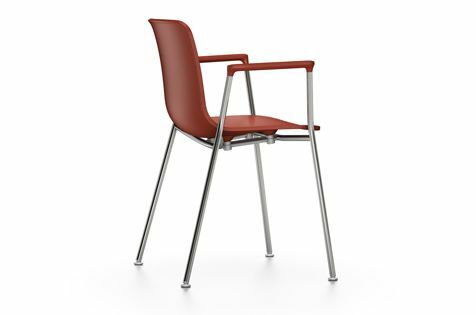 Jasper Morrison created HAL (2010/14) as a versatile family of chairs with a clean contemporary look. A wide selection of bases, materials and colours are available for HAL chairs, along with a fixed seat cushion or removable seat covers. Colour matched to the small attachment parts for the seat shell, choice of white (except HAL Wood and HAL Ply Wood) or basic dark. All bases fitted with glides for carpet; felt glides optionally available for hard floors. Four-legged base of chromed tubular steel. Up to 6 chairs can be stacked on the floor and on the stacking trolley. Colour of armrest always matches seat shell.